Once upon a time, developer Mane6 was working on a fighting game called Fighting is Magic, featuring characters from My Little Pony: Friendship is Magic television series, but development on that game has since ceased (and desisted). Interestingly, one of the television show's creators, Lauren Faust, was following the game's development and offered to join the team and create new original characters for the game. 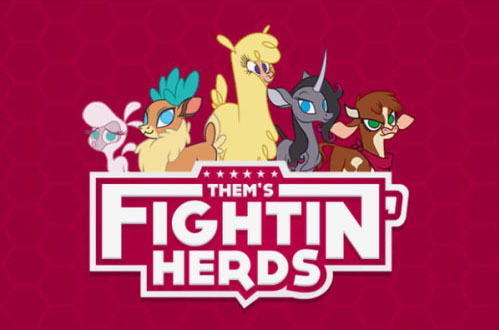 As a result, the newly-titled Them's Fightin' Herds has an entirely new roster of seven four-legged fighters engaged in cutesy 1-on-1 battle against one another, and it has been successfully funded via an Indiegogo campaign that raised more than $500,000. This is a 4-button fighter with light, medium, heavy, and magic attacks, as well as combos, juggling, and super attacks, as well as a story mode for each fighter. The game is headed to PC, Mac, and Linux and was announced for release in April, although no new relesae information has been posted for some time.